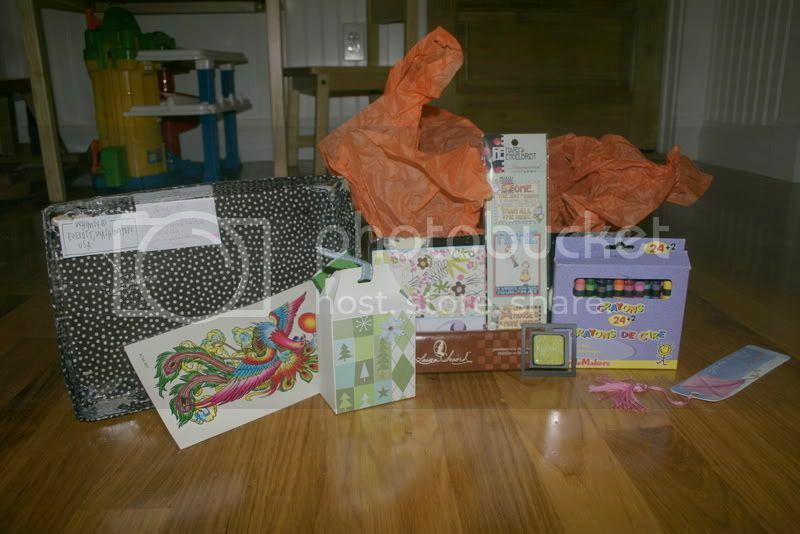 The PIF contest is now closed, and the winner is Shelly Overlook! Congratulations, Shelly! And thanks to everyone who entered. Today is my last day of single parenting. Can I get an "Amen"? All in all, the ordeal was... not that much of an ordeal, considering. Jack was honestly a perfect angel all week, at least until last night (see below). The worst of it was being stuck at home for two days in a row due to snow and illness. Not my illness, the illness of the people I was going to go visit yesterday so I could have some face time with adults. So as a result of being stuck inside my house for two straight days with no adults I got a bit depressed last night. I may have cried a little. But I would have cried a lot less if Grey's Anatomy - which I never even watch anymore but NBC was showing reruns - had not featured an eighty-year-old man performing futile CPR on his dying wife of sixty years. That and the fact that I was stuck at home folding LAUNDRY while Andrew was gallivanting around the California coast, living it up with restaurant dinners, hotel linens and ADULT CONVERSATION. So yes, there might have been a tiny bit of martyred resentment in those tears last night. Somehow, I gathered myself together and was just about to get into bed when Jack opened his bedroom door. I ended up in his bed for awhile, then in the rocking chair in his room. I kept waiting until I heard steady even breathing and then I would try to sneak out when up he would pop! 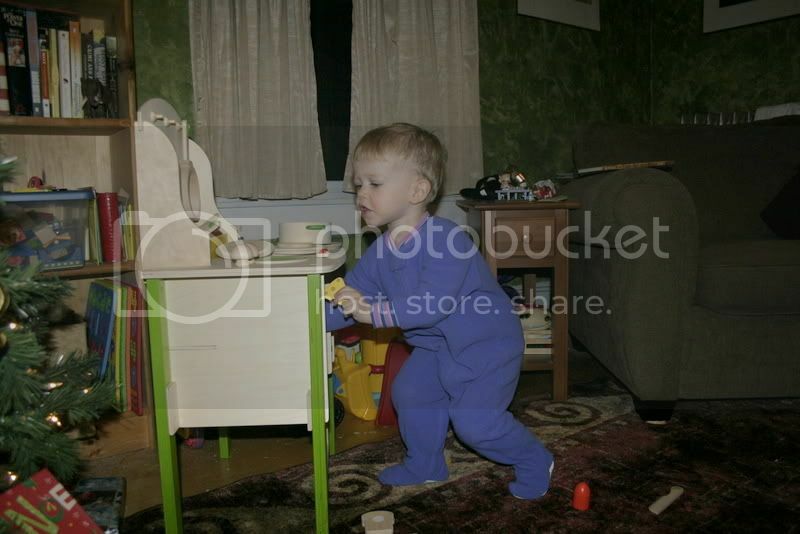 "Sit in chay-ah, Mummy!" he would whimper pathetically. Imagining how I'd feel in the morning if I slept curled up in a rocking chair all night, I tried getting back in his bed for a while, but ultimately I had to push my own bed against the wall and we both "slept" there for the rest of the night. I should note that "the rest of the night" consisted of the hours of 3:00-6:30 am. So today we are going to visit my friend The Photographer even though Jack and I are too tired to go anywhere and having lunch in a restaurant with a sleep-deprived toddler is probably a bad idea. But if you look back up in the first paragraph, you'll see that I have not left the house or seen another adult for two full days and it is not doing good things for my psyche, so I'm willing to risk it. Let's just hope I can get the car over the sheet of ice we call a "driveway." So it looks like the dire predictions of snow all the livelong day were true. It started at dawn and hasn’t stopped yet. The neighbor kid is on his second round of shoveling me out right this very second and when I went out to give him the money (I gave him what I think is a lot: $80. That’s a lot, right? It’s a pretty awful job he’s doing. ), he said he’d be back at least one more time after it lets up. Thank heavens for neighbor kids, people. Especially since the snow has turned to some sort of wintery mix – I think it’s freezing rain, but despite Becca’s multiple patient explanations, I can never remember the difference between freezing rain and sleet. (Sleet freezes in midair and freezing rain freezes on contact? Right? That would make this sleet, I think.) Suffice it to say it is a miserable form of precipitation that will result in a hard layer of ice on top of the eleven hundred feet of snow. Ah, winter! It’s a magical time. And the child is due to wake up from his nap pretty much any second and then we have a loooonnnggg afternoon to fill with no hope of adult conversation at the end of it because the other adult is at a conference in California and I am trapped inside by eleven hundred feet of snow. So. Cookies will be made. And consumed. I’m just saying. This means, of course, that I will be hosting my own PIF contest soon. Actually… now. I’m going to host it now. What is the point of waiting, right? I don’t know what I will send to the winner, but I will figure that out after I find out who won. If the winner has a blog, I will see if I can guess what sorts of things the he or she – oh, who am I kidding, SHE – might like. If she doesn’t have a blog, I’ll just pick stuff I like and she’ll be GRATEFUL. So. Here are the rules. Leave a comment on this post between now and…. let's say Saturday, January 31, 5pm Eastern time, and then I will use a random number generator to pick a winner. If you are related to me, you are ineligible. See? It doesn’t even have to be good! *PIF contests are where you send someone a prize, and then THAT person has to send someone ELSE a prize and so on. Idea credit: Swistle. **Which is not to say the chocolate bar was not also put to good use, just that its use has been fulfilled. So I opened my calendar this afternoon to write something down, and I discovered that tomorrow I will be twenty weeks. Which means that last week when I took that picture I was nineteen weeks, not eighteen as the captions used to indicate. This means that tomorrow I will be halfway through. Yikes. In other news: The neighbor kid has been officially retained for snow removal tomorrow. The poor sap. 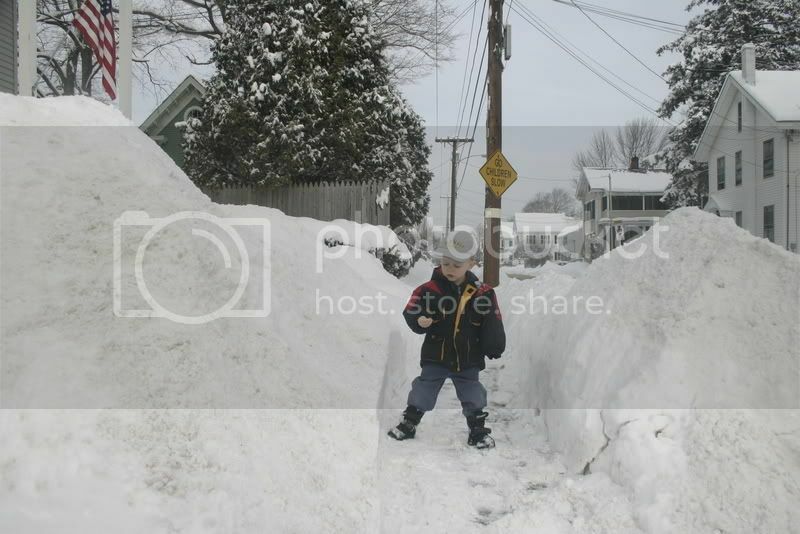 I bet he does not realize exactly how tall that mountain of snow is in my front yard. Just as I knew I would, I have joined the ranks of moms who take far fewer photos of their second (and third and fourth and fifth and sixth – TRUST ME when I tell you there are very few photos of the sixth baby) than their first. 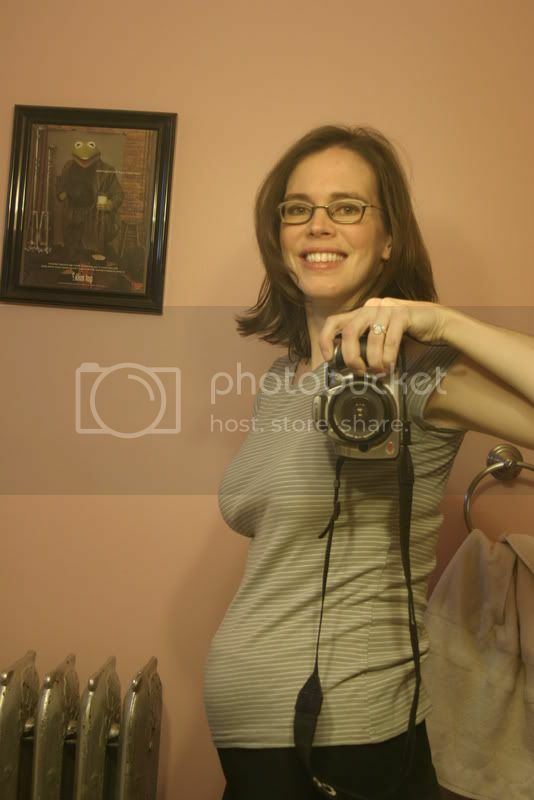 And we start even before the new baby is born by failing to take any belly shots until the eighteenth week. Yes, I also got a haircut. I’m pretty happy about it, because it was overdue by about seven months. I’m pretty sure I hadn’t had a haircut in at least nine months. The hairdresser, thinking that I was enamored with long hair despite it’s unkempt, scraggly appearance, was conservative in her snipping and I had to ask her to go even shorter. BLESSED RELIEF. But back to the pregnancy and how it’s not as awful anymore. The nausea is gone, and that is a blessed relief if there ever was one. Currently, my only symptoms are sciatica, the inability to stay awake past 8:30pm (this is possibly a symptom of having a two-year-old), a mild discomfort from my stiffening, growing belly, and the totally cool and reassuring yet simultaneously annoying swoosh swoosh roll poke of the baby girl currently residing in there. Oh! Did I not mention? It’s a girl! Yup. We found out this time because neither Andrew nor I felt that the discovery added anything to the event of Jack’s birth. I don’t mean, of course, that we were disappointed that Jack was a boy, I just mean that with so much going on and the immense relief of being done, that we would have been thrilled if they had said he was a penguin. So this time, we wanted to know what sorts of clothes to buy*, and whether or not there will eventually be a problem with the fact that they are going to be sharing a bedroom. But I figure we have at least six or seven years before that matters, so, meh. In other news, unrelated but for the fact it is going to snow AGAIN on Wednesday, leaving me and my pregnant self all alone to deal with it**, Andrew is away on a business trip until FRIDAY. He left at 4:00 this morning and will not be home until midnight this Friday. Pray for me. *Translation: We wanted to know which sorts of clothes my siblings should set aside for us, because with eleven nieces and nephews, I try not to buy too many clothes at all. **I plan to deal with it by hiring the neighbor kid. I already have to take the trash out all by myself, you expect me to shovel snow too? I AM PREGNANT. Cut me some slack. I have to admit, I got a little choked up today. And isn’t it amazing to think that when Jack is a teenager, he likely won’t really understand what the big deal was? First, everyone should go congratulate Arwen on the birth of her son! What was that I said about autumn in New England being worth the winter? I have been rethinking it. 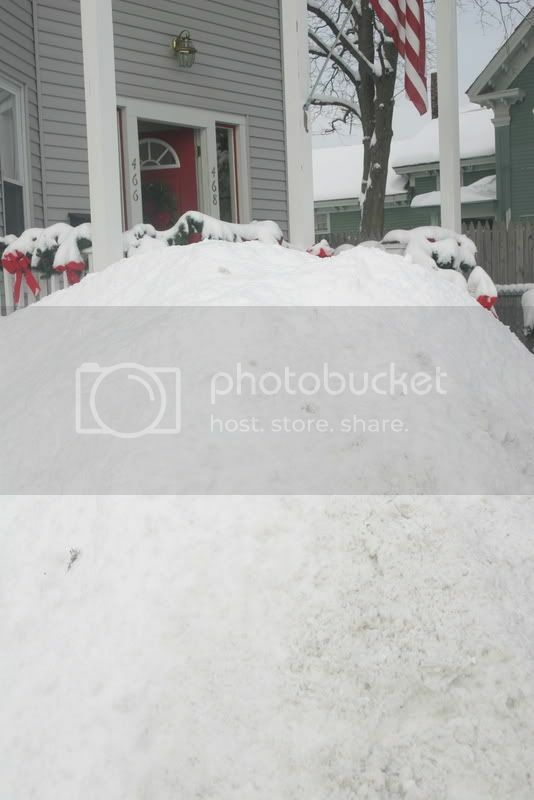 That is a picture of the snow in my front yard. I took it from a standing position. I am five feet eight inches tall. Now, we didn’t actually get seven feet of snow this weekend, it’s just that we have a four-car driveway and the front yard is just about the only place we can throw the snow. 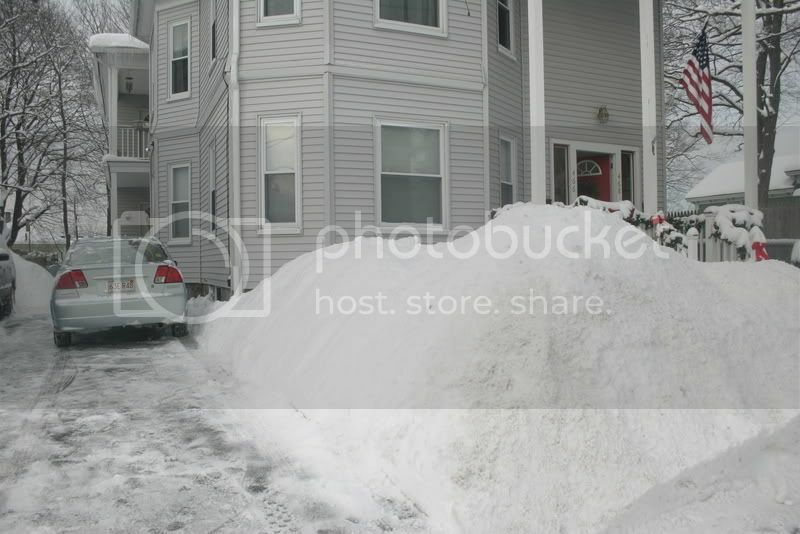 Our front yard is maybe twenty square feet, and it has been snowing about every three days since December 20th or so. Thus, the pile in the front yard is getting… large. Yesterday, it snowed all day. Andrew and I both shoveled in the morning and Andrew went out again in the late afternoon with the snow blower after it had finally stopped. But then! It snowed again last night! Five more inches this morning! So, yeah, whine whine whine. But can you blame me? Let’s change the subject, shall we? Have you ever noticed that there are certain items that, when you go out to purchase them for the first time, you nearly have a heart attack at their price? This happened to me when I tried to buy sweatpants and then again when I tried to buy socks. I didn’t buy either of them on the first go because I thought I was being ripped off. Socks and sweatpants, are items that ought to just GROW in your dresser drawers, don’t you think? And I’ll tell you, even though I was fourteen the first time I tried to buy sweatpants, I didn’t buy them then and I haven’t bought them yet. I can’t seem to get my mind around spending $50 on something that I can’t wear outside the house. So I just wear Andrew’s. The reason I am bringing this up is because we have been replacing the window treatments in our living room and dining room. Have you ever bought window treatments? GAH. We wanted to get Roman shades, but you can’t cut those to fit and we don’t have a hundred billion dollars. And, hey! I never posted pictures of Christmas! Well, since I will be putting my “Christmas” cards in the mail tomorrow, this seems almost timely. 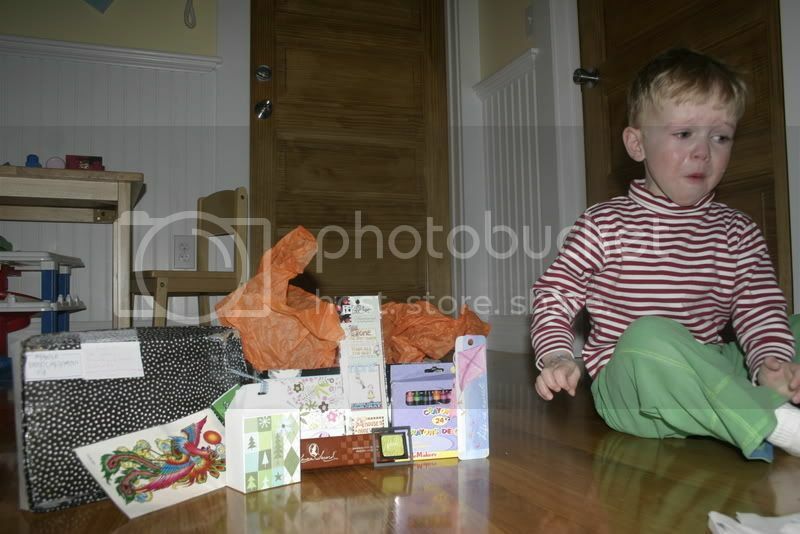 Jack seemed very suspicious upon emerging from his room Christmas morning. We got Jack a kitchen, and just this morning he made me a sandwich and then some pasta and sauce. He got a coffee maker and some cups from his Aunt, so we had some coffee with it. Then, this afternoon, we had a tea party with imaginary cookies and juice. Jack is very into pretending lately, and it is utterly charming in every way. I’ve officially graduated into maternity wear, so I will have to start taking some photos of the growing belly. 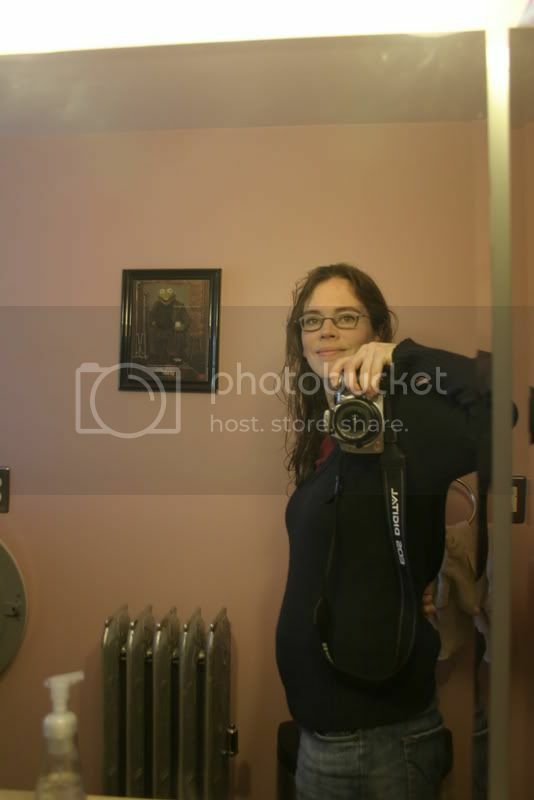 It’s not much now; when I’m dressed, I still don’t look pregnant. I just look like I’ve gained a bunch of weight. But this time I started wearing my good maternity jeans immediately instead of spending two months wearing cheap, saggy, hateful, loathsome pants. My unsolicited advice to newly pregnant women is always to spend money on at least two pairs of nice maternity pants. So worth it. There is a boring background story to this outcome that involves me endlessly surfing the internet and trawling discount home stores trying to find a duvet cover and/or curtains that would complement purple walls while also fulfilling my long list of other criteria. It ends with me dithering awhile between a purplish grey leaf patterned one from Target and a brownish goldish... uh... leaf patterned one from West Elm. But once I realized that the one from Target actually cost more because it requires new sheets, I went ahead and ordered the gold one. So now the question is: What the heck color am I supposed to paint my walls now? I'm still holding out a secret hope that there is a purple that will go, but I think I may be kidding myself. OK, people. You were all very helpful when I was painting my kitchen, so I have another project for you. We are (finally) going to redo our bedroom. Currently, it is a lovely shade of old, peeling wallpaper and cracked peeling horrible blue trim and a disgusting peeling popcorn ceiling with an ugly old naked-bulbed ceiling fan. I'm not even going to show you a picture right now because I find it terribly embarrassing that the bedroom is still in this state after having lived in this house for three years. But here is my problem: I cannot handle the sheer amount of choices available to me for curtains and bedding. We have loose plans to paint the room a pale-ish purple with a darker purple behind the bed, but I am at my wit's end in trying to find curtains and a duvet cover that will complement this. I'm looking for dark ones with a print that isn't too girly. Does anyone know where I can find something that doesn't cost a million dollars? The uploading process went surprisingly smoothly! But before you enjoy the stylings of Jack, I want to give you the lyrics of a few of the songs he's singing. The first is the Gloria from the children's mass. It has clapping in it, and he's very into songs with clapping. There's more, but that's as far as he got. I couldn't bring myself to edit any of the songs out, so the video is kind of long. But if you make it to the end, you'll get to hear some fantastic jokes about pickles. Jack sings from Maureen on Vimeo. My absolute favorite part about being a grown up. What, you thought I would say "Christmas?" See, I can't write about Christmas, New Year's, or Jack's transition, because these posts require the transference of photos from my camera to the computer and then I have to UPLOAD them and then I have to LINK to them and I can't do any of that right now because the computer is currently converting the video of Jack singing for five full minutes. And after I convert it, I will have to upload it to Vimeo and that takes about eleven hours for some reason, so the computer will be busy for awhile. And then I will likely find out that the video looks weirdly squished or something and have to start over, but let's worry about that when the time comes. Conveniently, I have now also explained why I can't write about Jack singing, as that is a video that will be posted sometime next year after it has been converted and uploaded successfully. As far as the cardinal blessing my family, well, that's kind of all there is to tell. He was at our church today to celebrate the closing mass of our 125th anniversary year. I'm a bit thrilled about it because I really like this cardinal, and this is the second time I've received his blessing. The first time I was pregnant with Jack, so both Jack and his little brother or sister have now been blessed by the cardinal in utero. But the story is pretty much: He blessed us. The end. It's not like we sat down and had a long private talk or anything. And all I have to say about maternity clothes is that I am glad they are stretchy because now the pants I put on in the morning no longer cut off my circulation at night. Sadly, they are still slightly too loose in the morning, so I'm at the particularly annoying size range of 12-maternity right now. I am almost looking forward to getting big enough that the same pair of pants fits me for the WHOLE DAY. But I am not going to write about maternity clothes. I am not even going to tell you that when I picked them up from my sister-in-law, the family stash of maternity clothes (to which I have contributed about five shirts and two pairs of pants) has morphed into a mind-boggling five enormous bags and one huge storage container. No, instead I would like to tell you that my favorite part of being a grown up is not being allowed to drink or rent cars. It's not getting paid about ten times per hour what I made as a cashier. It's not even getting to stay up as late as I want (10:30pm) whenever I want (only on very special occassions). No. What I revel in is the knowledge that when I'm out somewhere, I can stop for doughnuts any time I want to. There's a Dunkin' Donuts every 150 feet in this state, so if I want a doughnut, dammit, I can buy a doughnut. I no longer have to beg and whine and plead with my father from the way back of the station wagon on the way home from church, I just have to decide to pull in to the parking lot. Just because I can stop for doughnuts doesn't mean I do stop for doughnuts; just knowing the option is there is enough.